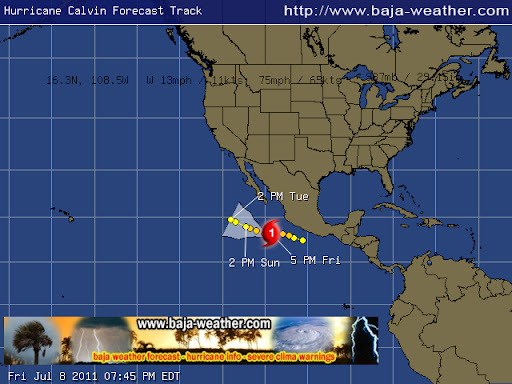 Calvin becomes the third hurricane of the 2011 eastern Pacific hurricane season. At 200 PM PDT the center of recently upgraded Hurricane Calvin was located near latitude 16.3 north, longitude 108.5 west. Calvin is moving toward the west near 20 km/h and this motion is expected to continue until Sunday. Maximum sustained winds have increased to near 120 km/h with higher gusts. Calvin is a category one hurricane on the Saffir-Simpson scale. Some fluctuations in intensity are likely today but the general trend is for Calvin to weaken. Distance at late Friday afternoon +/- 235miles to the Socorro Islands, 465 miles to Cabo San Lucas, 550 miles to La Paz, BCS and 370 miles to Puerto Vallarta. Hurricane-force winds extend outward up to 35 km from the center and tropical storm force winds extend outward up to 85 miles/140 km. Estimated minimum central pressure is 987 mb/29.15 inches.